Land use and its dynamics have attracted considerable scientific attention for their significant ecological and socioeconomic implications. Many studies have investigated the past changes in land use, but efforts exploring the potential changes in land use and implications under future scenarios are still lacking. Here we simulate the future land use changes and their impacts on ecosystem services in Northeast China (NEC) over the period of 2000–2050 using the CLUE–S (Conversion of Land Use and its Effects at Small regional extent) model under the scenarios of ecological security (ESS), food security (FSS) and comprehensive development (CDS). The model was validated against remote sensing data in 2005. Overall, the accuracy of the CLUE–S model was evaluated at 82.5%. 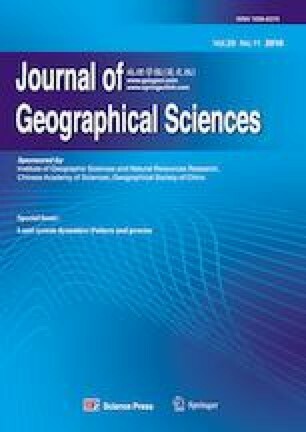 Obtained results show that future cropland changes mainly occur in the Songnen Plain and the Liaohe Plain, forest and grassland changes are concentrated in the southern Lesser Khingan Mountains and the western Changbai Mountains, while the Sanjiang Plain will witness major changes of the wetlands. Our results also show that even though CDS is defined based on the goals of the regional development plan, the ecological service value (ESV) under CDS is RMB 2656.18 billion in 2050. The ESV of CDS is lower compared with the other scenarios. Thus, CDS is not an optimum scenario for eco-environmental protection, especially for the wetlands, which should be given higher priority for future development. The issue of coordination is also critical in future development. The results can help to assist structural adjustments for agriculture and to guide policy interventions in NEC.